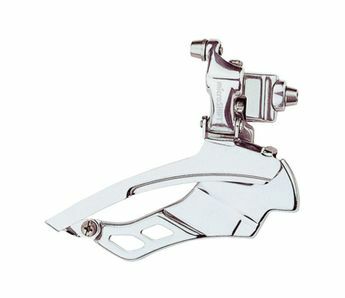 The MicroShift R10 Ten Speed Front Derailleur- Braze-on or Band type. It is available in two diameter options either 31.8mm with ring spacer or 34.9mm. And with two chainring options either 3 x 10 52/39/30T, 3 x 10 50/39/30T. Compatible to work with Shimano systems. Lightweight at only 117g for the braze-on option and like all products from MicroShift, it has been well designed to be both durable and strong. Note: Clamp spacer (SM-R31Not supplied) allow the derailleur to be Φ31.8mm frame tube. Without ring spacer, the derailleur mounts to Φ34.9mm frame tube.